There are lots of rumors about the Android Go smartphone from Samsung in making, but Samsung hasn’t confirmed anything about it yet. 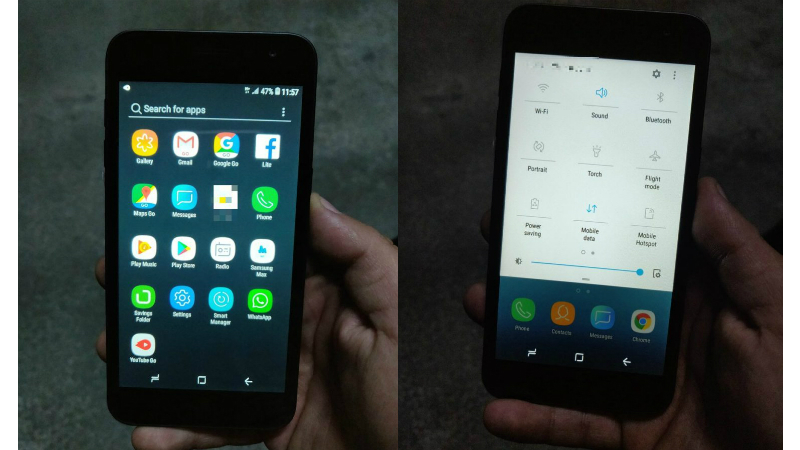 Today, some live images of the smartphone have been leaked on the internet which shows a lot about the smartphone including the user interface not being stock Android. The pictures even show that the smartphone is not running the stock Android interface at all, we can clearly see the Samsung Experience UI with a simple navigation bar and app drawer. One thing to notice in the picture is that the smartphone is installed with all the lite apps which are made especially for the Android Go smartphones with less RAM. Also, there is less number of bloatware apps appearing in the app drawer, Samsung usually puts a lot of bloat apps on their smartphones. We think that Samsung did this so the Samsung users will get the same user interface taste with better and cleaner experience. At the back of the smartphone, the smartphone comes with a single camera module, LED flash and the Samsung branding. Last month, we saw a bunch of Android Oreo Go smartphone launched from a bunch of different manufacturers, and it seems that Samsung might launch its Android Go smartphone this year. According to some previous leaks, the Samsung Android Go smartphone will feature a 5 inches Super AMOLED display with 1.4GHz quad-core Exynos 7570 chipset. The smartphone will feature 1GB RAM and 16GB of storage. The camera will be 8MP rear and 5MP front, and the battery might be 2600 mAh.